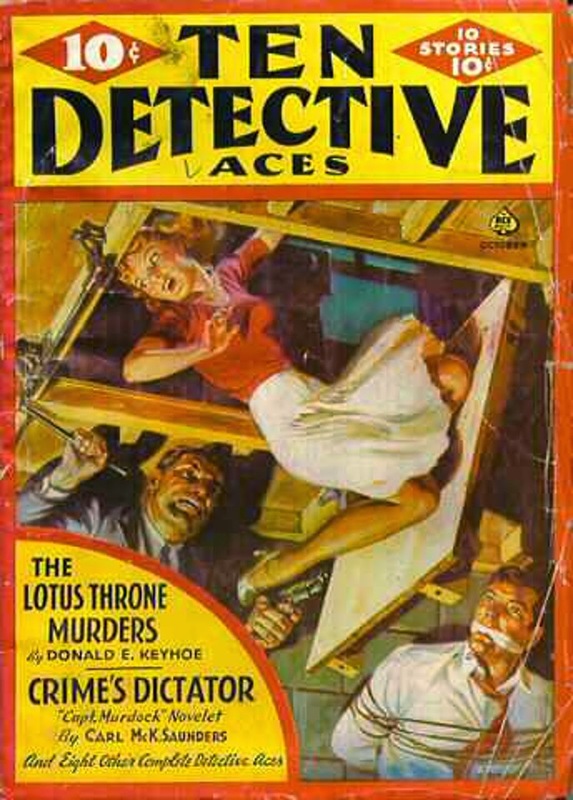 Another action-packed Norman Saunders cover on this issue of TEN DETECTIVE ACES. I realized recently that one of the featured authors, Carl McK. Saunders (no relation to Norman, since it's a pseudonym) was really Philip Ketchum. There's a collection in the works of some of Ketchum's detective stories under the Saunders by-line, and I'm looking forward to reading it. Also in this issue are stories by Harold Q. Masur, better known as a hardcover mystery novelist with a long series about lawyer Scott Jordan, the prolific and genre-hopping Joe Archibald, and a lead novel by Donald E. Keyhoe (yeah, the flying saucer guy). And Masur will always live in my heart as Robert Arthur's successor as editor of ALFRED HITCHCOCK PRESENTS: anthologies...it's because of Masur that I was reading Joe Gores before I read WINNIE THE POOH...not too shabby an editor elsewhere, as well.